Our Unity Symbol © is in use on compassion bracelets, t-shirts, lapel pins, and other products. With hundreds of thousands distributed and sold, our Unity Symbols © have been worn by people sympathetic to the need for the responsible immigration reform, as well as dignitaries and world leaders in the United States and around the world. 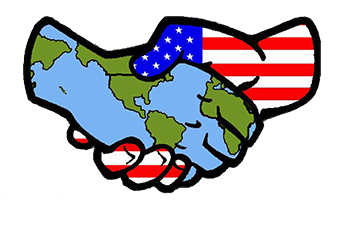 Just as the handshake symbolizes an offer of peace, trust, unity of purpose and civility, so the Universal Unity Symbol © offers a peaceful, civil call to action through unity of purpose. 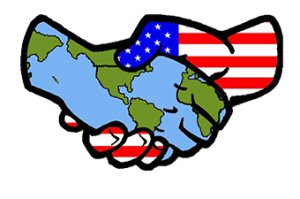 The Unity Symbol © has become the standard nonh-offensive icon representing the need for agreement and understanding between the United States and the rest of the world. It is licensed and used by many corporations on their packaging to show support and to create and continue strong relationships with a large immigrant customer base. Unity Symbols © have been created for all of the 195 countries in the world to ensure represenation for all of the immigrants currently living in America. The extraordinary level of exposure and recognition of the Unity Symbol © will ensure that products, events, demonstrations, and marketing materials proudly displaying this image will receive positive recognition form the community of responsible immigration reform.